Guest post from Mark James, Canadian Association of Environmental Law Societies (CAELS) Co-Director. Krystyn Tully, Vice-President of Lake Ontario Waterkeeper, is presenting “The Blueprint for Swimmable, Drinkable, Fishable Water.” In addition, they will be holding a workshop on how citizen scientists can play an important role in protecting the environment. Participants will learn how collecting and sharing data is the first step to better environmental stewardship. Other panels will discuss issues such as endangered species in Ontario, how to improve the international environmental performance of Canadian companies, and resource development in Northern Canada. The conference is an interdisciplinary event bringing together law students, lawyers, scientists, and community members to discuss current issues in Canadian environmental law. CAELS’ mandate is to present current issues in environmental law and to give attendees a series of steps for how they can become engaged in protecting the environment. The conference is open to the public. The cost of attending the conference is $15 plus tax. 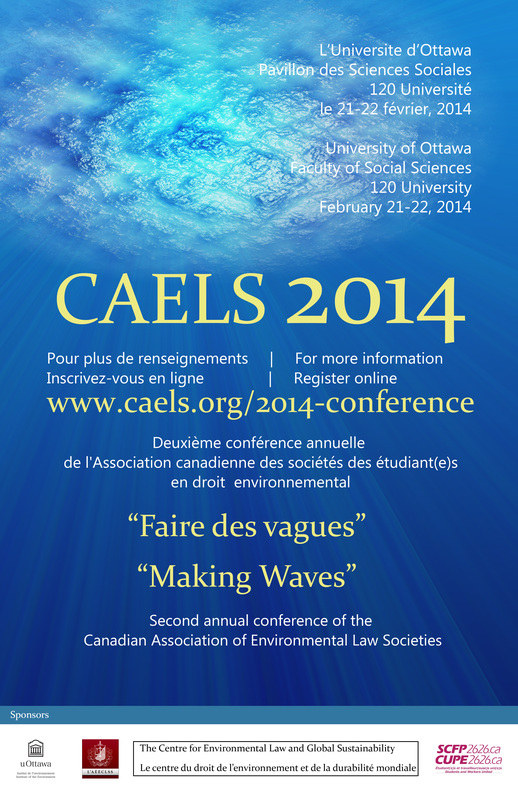 Registration can be done online at www.caels.org until Thursday February 20 or in person on the day of the event. Note: The agenda and further information are available at http://caels.org/2014-conference/.